Get set for the 2-3 week tan! 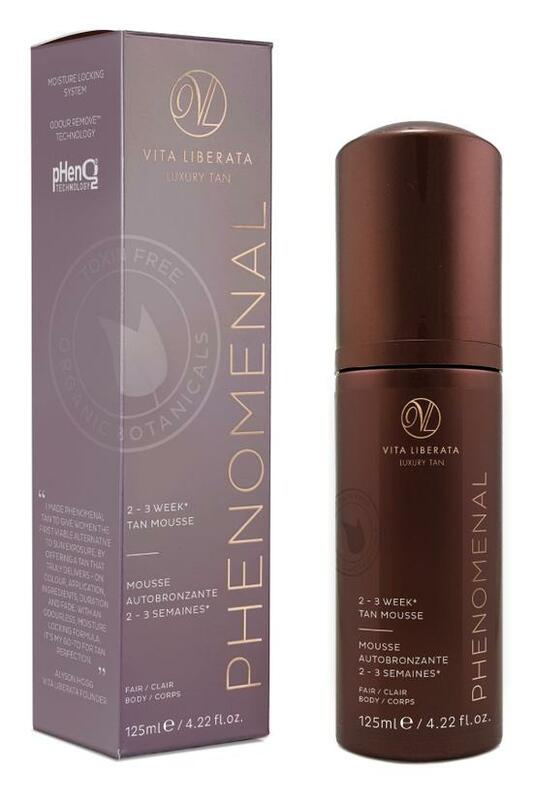 Working with your skin's own pH, pHenomenal tan mousse is a long lasting, super-fast drying, natural tan with Odour Remove™ technology for an odourless tanning experience. This product is formulated without Parabens, Fragrance, Alcohol, Animal derivatives, Petrochemicals, Sulphates, and Silicones. Available in Fair, Medium or Dark. Application Tanning Mitt sold separately (06094). · lasts up to 4 times longer than regular tans. · incredibly easy to apply even for the novice tanner. · Certified organic and natural extracts for anti aging, skin enhancement and a natural tan. · Flash Dry for instantly dry results. · Available in Fair, Medium or Dark. Don't moisturize or use moisturizing shower lotions prior to application. Apply to clean, exfoliated skin with a tanning mitt using long, circular movements. Use sparingly on hands, feet, knees and elbows. Wait 4-8 hours before showering. For longest lasting results, apply 3 times over 12-36 hours, showering with water only between each application. From our Irish base we created the world's first odorless tan in 2007 and our unique Odor Remove™ technology is now present throughout the collection. In 2011, we became the first completely non-toxic tanning brand free from parabens, perfume, alcohol and all chemicals of concern. Natural and certified organic approved extracts are key to our formulas.